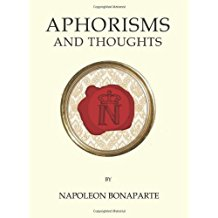 More quotations than aphorisms, still some good wisdom here though. It’s short, too. You can get through all ~500 in a couple sittings. These ones were my favorites. It is rare that a great assembly is reasonable: it is too readily passionate. Every hour of time wasted during youth creates a chance for future misfortune. A great reputation is a great noise; the more you make, the more it spreads: laws, nations, monuments – everything crumbles; but the noise remains. Man only succeeds in life by governing his character or by forging one. Strong spirits turn away from sensual pleasures just as seafarers avoid reefs. You only believe that which it pleases you to believe. The majority of those who do not want to be oppressed want to be oppressors themselves. but by stirring the masses. The former method is just intrigue, and only generates secondary results. The latter method is the way of a genius, and changes the face of the world. There are only two levers to stir men: fear or self-interest. Every great revolution must act on fear; when the interests are at stake, great results do not follow. You can only do well what you do yourself. The superior man follows nobody else’s path. You can only lead the people by showing them a future: a leader trades in hope. Courage cannot be counterfeited: it is a virtue which escapes hypocrisy. You become the man of your uniform. There are only two kinds of war strategies: good ones and bad ones; the good ones almost always fail due to unforeseen circumstances, which often make the bad ones succeed. siege; once the fray has begun, the skill consists in making a large amount of gunfire converge on the same point, without the enemy being able to predict it. The greatest danger occurs in the moment of victory. Social law can give all men equal rights; nature will never give them equal faculties. Populations need noisy celebrations: fools like noise, and the multitude are fools. Men are better governed by their vices than by their virtues. politics, absurdity is not an obstacle. It is easier to make laws than to apply them. It is easier to deceive than to undeceive. Some vices and virtues can depend on circumstance. He who can absorb the most images into his memory is the one who has the most imagination. You can thwart many things by pretending not to see them. Envy is a confession of inferiority. Human weaknesses must be recognized and adapted to rather than fought. In order to be happy, marriage requires a continuous exchange of sweat. Habit condemns us to a fair number of follies, and the greatest of these is to become enslaved to them. A good philosopher makes a bad citizen. You can stop while ascending, never while descending. As a rule, you must always reserve the right to laugh the next day at your thoughts of the previous night. In the long run, too much power ends up corrupting the most honest of men. Whoever ends up possessing Constantinople will govern the world. The only conquests that leave no regrets are the ones made in ignorance. It is unjust for a generation to be indebted to the previous one; a loan should be limited to fifty years. Why should the people, who are not responsible for the debts of the deceased king, not have the privilege of the crown? A means to preserve coming generations from the greed of previous generations must be found, without having to resort to bankruptcy.